Almost everyone can always use some extra jewelry to go with their outfits. If you are the type of person who likes to switch up your fashion look but doesn't have a big budget, you will love this craft. Who would have thought that a beautiful black and silver bead necklace could have been made from copy paper and a few extra supplies? Since these accessories cost almost nothing, you will want to make more in different colors and designs. Just substitute the craft paper of your choice for the PDF digital download. Download the PDF template file here.The PDF file can be used with most graphics software, or in Adobe Acrobat. Cut eighteen paper necklace bead rectangles with a ruler and Xacto knife, from the printed template. If you are using colored paper, cut out eighteen rectangles 1.5-inches by 10-inches with scissors or a Xacto knife. Paint one end of each bead with a black sharpie marker. If you are using colored paper you can omit this step. Dip the beads in wood hardener. This step is crucial.PC-Petrifier wood hardener is the best product for paper beadwork. It hardens the paper bead plus adds a glossy shine. If you want to learn how to use the hardener properly, watch this YouTube video tutorial. The most important step is dipping the beads in the hardener and drying them. String the beads with fishing line, before dipping them in the product. You can, however, also use floral wire to hang the beads with good results. It is up to you to decide which method works best for you. After dipping the beads in the wood hardener five times hang the beads and let them dry. It doesn't take long. They should be dry to the touch after about an hour. The beads need about 24 hours to cure. The beads are glossy just from the PC-Petrifier.If you want to add extra protection, dip the beads in waterproof polyurethane and let dry. Assemble the necklace using the above photo as a guide. Pull the string through silver bead tube, and position bead tube onto the middle of the line. Pull two silver beads onto the string, and place onto each side of the tube. Continue to add one black bead and one silver bead as in the photo above. End with three silver beads on each end. 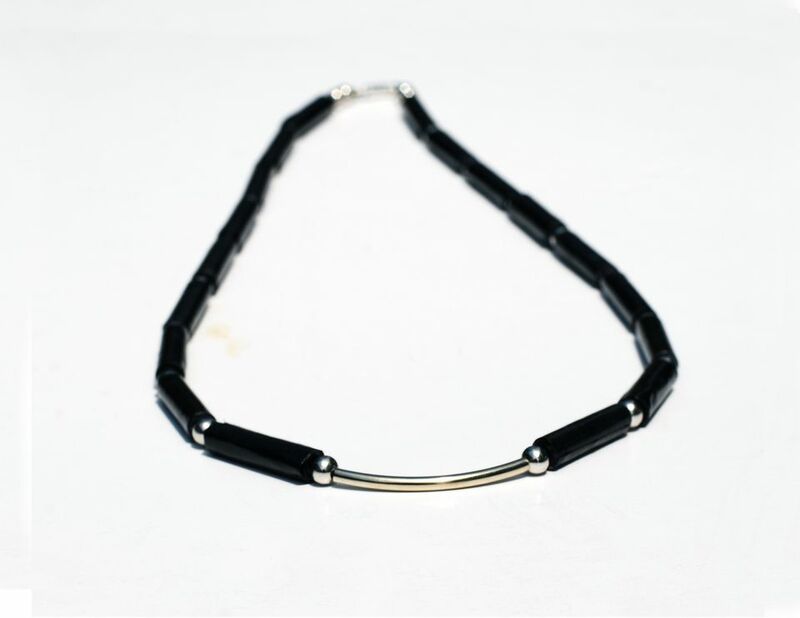 Attach magnetic clasp to each end of the necklace. Fasten the clasp with a crimp cover on each side. If you do not know how to attach a crimp cap, take a look at this informative YouTube video for help. Your necklace is now complete. The black necklace would look stunning when paired with any of the above earrings. You can access the papercraft tutorial and free jewelry template download here. The earrings are so easy to make. Get ready for compliments when wearing your new "designer" earrings and necklace!